In 2019 we are looking back at 10 busy and colorful years we'll celebrate with 10 discount offers (i.e. some crazy pop up sales) and little secrets and stories from behind the scenes! Join us and welcome to the family of hair lovers! 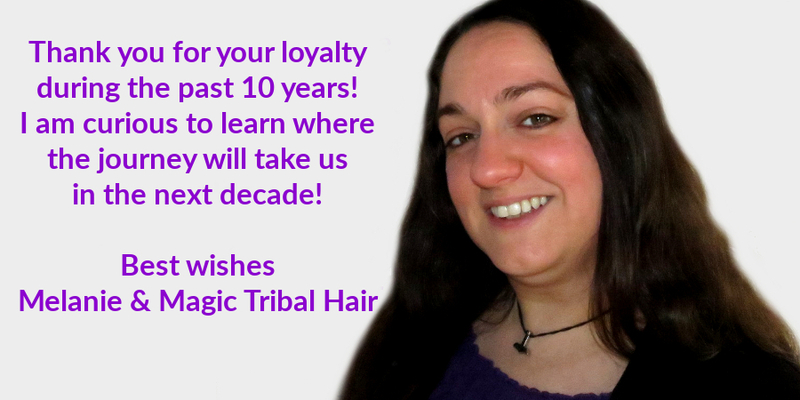 Welcome to the 10th anniversary blog series about my magic paradise of hair! In these series I will share amazing milestones and crazy and funny memories from the past 10 years with you! Naturally you'll also be informed about our many special anniversary offers. Is there anything in particular you'd wish to know? Feel free to share your questions in a comment below this article! I will write all blog stories during the coming months, so there is room to appeal to your inspirations and I'll include them as much as possible - you are the one I write this blog for, just go ahead and inspire me ;)! 10 years? But didn't you open this shop in 2018 only? Yes and yes, I did! 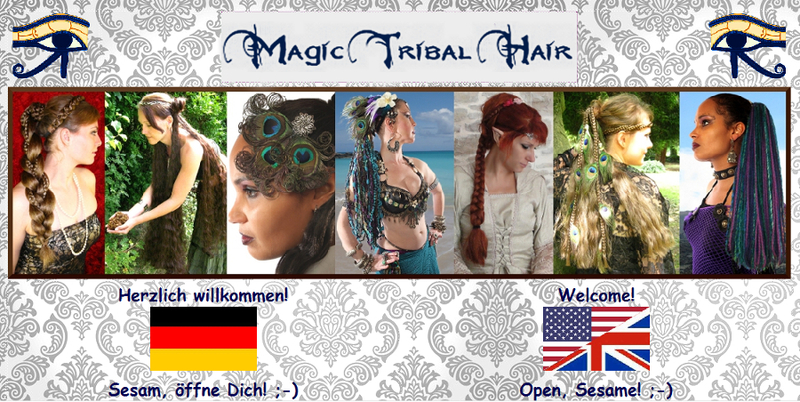 Back in 2009 I opened one website first, the site at www.magic-tribal-hair.com. That site became the European website later in 2018 when I opened this U.S. site here at www.magictribalhair.com. 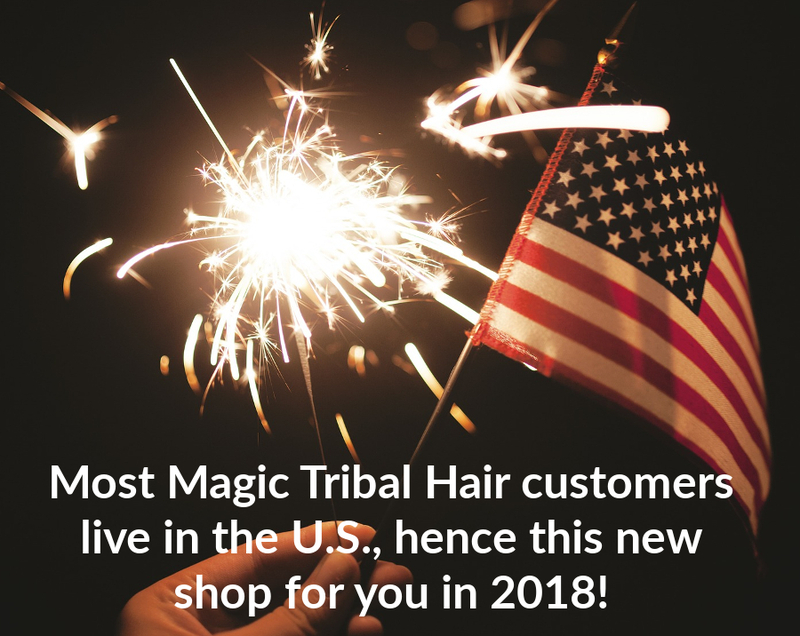 There are more Magic Tribal Hair customers in the United States than in all European countries together, so it's reasonable to give you your own website with prices and payment in U.S. $ and with your tax settings! Most of you found Magic Tribal Hair first through my shop at Etsy I opened in 2011. Naturally I can give you better prices here on my own website! Plus a much better service than on Etsy, just check my FAQ-page for custom color hair extensions including washing instructions and more and all the additional information in the service section (at the bottom of each shop page)! 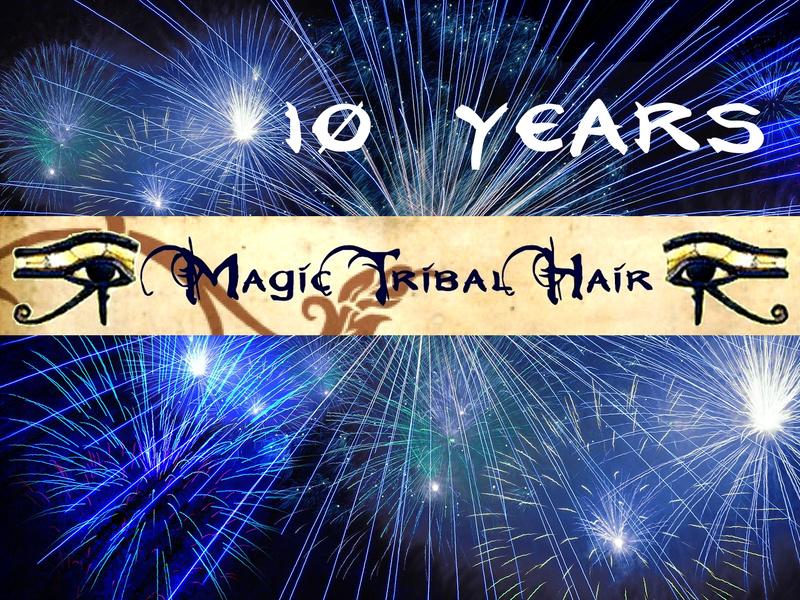 I also don't offer all products on Etsy as well and last but not least, special offers like the 10 anniversary bargains are exclusive for my shop here at www.magictribalhair.com! The U.S. site is also more convenient for my appreciated customers from Canada, Australia, Japan, New Zealand and all other countries outside Europe! We'll do some time travelling in different formats here in the blog! Join this little journey in time through the past 10 years and enjoy little stories told in anecdotes, quizzes and pictures! This is how you were greeted in the shop up to 2015 - and you had to choose the English site first! And now you even have your own shop with prices in U.S. Dollars and your tax settings! Talking about improvements... when I look at the old welcome page, I myself find a lot to criticize about design and such - don't you agree it's absolutely unfriendly that none of the models is looking & smiling at you? And why is there a brown frame around the picture collage? I know you can't answer this, because I did that, haha! Well, one really and luckily grows with one's tasks! 10 discount offers throughout the year! Get to know more about the 10 amazing discount offers that will come this year in this blog and on the anniversary offers site here! The overview always starts with the latest offer. Sometimes there are several offers at a time - make sure to check more than the first one on the list! A few of these offers will be crazy POP-UP-SALES with super large discounts like 25% to 50 % off. These offers will be available for a couple of days only, so make sure to subscribe to our newsletter so you won't miss! Some offers are even reserved for newsletter recipients, so this year it might especially pay back to subscribe. Naturally you can unsubscribe any time, simply by replying with "unsubscribe" to the newsletter. You can subscribe at the bottom of all shop pages, even at the bottom of this blog page. One of these special offers even lasts the whole year: Hip & hair tassels clips (our smaller yarn falls that especially tribal fusion belly dancers and larpers appreciate for costuming) are available at discounted prices. Most models with peacock feathers cost € 22,90* instead of € 25,50* and almost all models without peacock feathers come at € 17,90* instead of € 19,90*! This discount is usually only available in winter (November - March).